The Google My Account page found in Settings on your Android phone has a new look and feel today. A Material Design makeover is rolling out to everyone that brings a far cleaner and easier-to-navigate design to the page. This is a cloud-side update so there really isn’t anything you need to do to get it – just wait for it to arrive. With the new look, the Google Account page is brighter and easier to navigate. It is also setup it a top-tab design to get to various parts of your account so you can review specific elements, not just get one big overview. 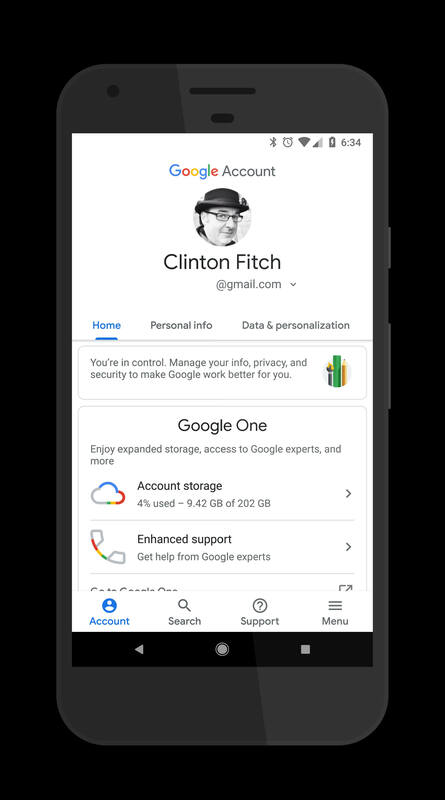 The Home tab provides an overview of your account where you can review your privacy settings, manage your Google Drive or One account including seeing the amount of storage you have remaining. If you have a One account, you can also get to your Enhanced Support from this tab. The Personal Info tab is somewhat self explanatory and is where you will find things like your name, password and contact information. Here is where you will also setup what bits of this information are shared publicly. The Data & personalization tab is where you will find privacy settings and activity controls while the Security tab is where you will find your 2FA (2 Factor Authentication) and recent security activity on your account. The People & sharing tab is where you will find your contacts (which will take you to the Google Contacts app on your phone), your family associated to your account, and any location sharing you have going on with others. Finally, there is the Payments & subscription tab which again, is somewhat self explanatory.